At sunset on Sunday, December 6, Hanukkah begins. Hanukkah is the Festival of Lights and it commemorates the victory of the ancient Israelites over the Syrian Greek army. The miracle of Hanukkah is that only one vial of oil was found with just enough oil for one day, and yet it lasted for eight full days. 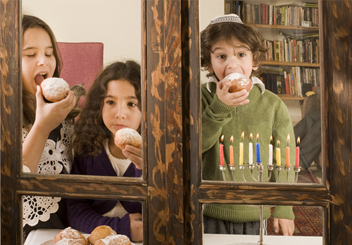 For the next eight days, families will light a candle on the menorah each night to celebrate the victory, play dreidel, and eat special foods unique to Hanukkah like latkes or jelly donuts. Gather friends. It can be played with as few as two people, but the more the merrier! Distribute tokens evenly among all the players. The tokens can be anything: pennies, gold fish crackers, Legos, etc. Every time the pot is emptied, or there's only one token left, every player puts another token in the pot. 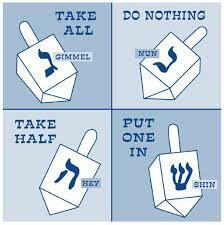 Nun ("nisht" or "nothing" in Yiddish) - Do nothing. Gimmel ("gantz" or "everything" in Yiddish) - Take all tokens from the pot. Hay ("halb" or "half" in Yiddish) - Take half of all tokens lying in the pot. If there is an odd number of tokens, round up. Pass the dreidel on to the next player. Keep playing until someone wins by collecting all the tokens in the pot! Sounds fun, right? The library has some great Hanukkah stories for you to share with your family. It's always fun to learn about something new. Tis the season!